This site is encrypted for your security. How do I pay by Credit or Debit Card? / I do not want a PayPal account. Our preferred method of payment is via PayPal. We do appreciate that not everyone has, or wants, a PayPal account. You may if you wish pay by credit or debit card on the web page. You will be taken to another page, this is the PayPal payments page. When you click on this it takes you to another page where you will be able to enter your card details. Once you have completed your payment PayPal will ask you if you would like to open a PayPal account. If you do not wish to do so simply decline and it will then close the payments window. If you are still having trouble please email us with what the problem is, simon@poppypins.co.uk, with your phone number, and we will call you back to try and resolve the problem with you. 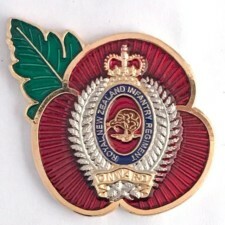 All our Poppy Badges are 40mm tall from the base to the tip of the leaf and 34.7mm at the widest point including the leaf. They are held on using a brooch safety pin fastening with a rollover locking device. They are made from metal and enamels and each badge is hand painted using top quality enamels so you may see slight variations from one badge to another. This image is the engravers artwork. The finished badge you do not see the gold veins and it is a darker red. Please bear in mind that we are not here 24/7! This is not a full time job and the office is not always manned. All emails get answered as quickly as possible, usually within 24 hours, but this can take a little longer when we are very busy in the run up to November 11th. Next is the answer phone on 0117 405 7238. If we are in the office we will answer your call, if not please leave a brief message with your name and number and we will call you back. Again we will call you back as soon as we can, usually within 24hrs but as above this can take a little longer during busy periods. Last option is to write to us at Parade Pins Ltd, 7 The Labbott, Keynsham, Bristol, BS31 1BD. In all cases if your message is about an order that you have placed please quote your order number so we may find your order quicker. I can’t find my badge. I would like to have a badge made. If you are having trouble finding a badge you may need to refine your search criteria. Generally we will use the full name of the Regiment or Unit first followed by abbreviations, if we know them. If you are still having problems it may be that we have not yet done the badge that you are after. If you need any help please email us at simon@paradepins.co.uk and we will either inform you that the badge is not in the range or send you the link to the badge on the web page. If we have not done your particular badge we are open to suggestions for new badges, but, there are some criteria that need to be followed. We are MOD license holders and as such need to follow the MOD guidelines on badges, being that we cannot alter, add to or take anything off a badge or alter it in any way if the badge is MOD property. Please check with us to confirm. We have to have 50 badges made as an initial order so we need to know there is going to be a market for them once we have made them. We will also take on private commissions for a badge that you would like made but need to ensure you have the correct copyright permissions to use any images you send us. When you place your order you will get an email to notify you that it is being processed through our system. Once your order has been processed and is ready for posting we confirm your order and send you another email to confirm. This is your notification that your order will be getting posted. Orders received before midday get processed and posted the same day, or next working day if on a weekend. These notifications contain your order number. You will need this should you have any query about your order. If you do not get an email it means you have entered your email address incorrectly, or have your security settings set to block these types of emails, please ensure you check your details! This also applies to your address. You need to ensure you send us your FULL postal address, please check your order. We use Royal Mail first class large letter for postage so there needs to be someone at the address to sign for your order. If no one is home the post person should leave you a card telling you they tried to deliver but you were not in. You will need to go to your sorting office to collect it. You may enter a different address at the point of ordering if you would like your order to go to a work address, or a relative. If you do not collect your order it will get sent back to us. We will then contact you to find out why you have not collected it and will check to see if you gave us the correct postal details. Any order that needs to be re posted will need to be paid for. Free postage is for one post only. International Postage option is available at the checkout stage. We will post World Wide and use Royal Mail International signed for where available. Please bear in mind that the option set on the order form will cover you for up to 5 badges. Anything above this please contact us for the postal rate as it is calculated on weight. As we draw closer to November 11th we will open up Special Delivery. This guarantees next day UK delivery, but it does cost a bit more to use this option. Saturday Deliver is another option and is again more expensive. Sadly we cannot guarantee when your order will get to you, this is totally out of our hands. Despite sending by 1st class Royal Mail do not guarantee, unless using Special Delivery, to get your order there the next day. In fact they say it can take up to 21 days to get to you, 28 for International. Please bear this in mind before messaging us asking where your order is. We keep tracking numbers for all orders for 6 months after posting and will always supply you these details upon request. Occasionally we will have a badge go Out Of Stock due to high demand. We also put new badges up on the web page that show as being Out Of Stock. If you would like to be notified when a badge comes in stock please click on the JOIN WAITLIST button just under the picture of the badge. You will then be able to add your email to the list. Once the badge you are after comes in stock we will send you an email to notify you. Being on the waitlist does NOT reserve a badge for you so you need to react to the message. You also need to bear in mind that everyone else who is on the waitlist will be getting the exact same message at the same time as you do and the popular badges have been known to sell out in a matter of a few hours once we send the message out! How much goes to the RBL? We have a Commercial Participation Association with the Royal British Legion which allows us to use the In Support Of logo on all our merchandising and ties us in with a specific donation amount which is set by the RBL. This amount is currently 20% of profit after we have paid all our other requirements such as corporation tax, income tax VAT, postage and Royalties to the MOD. In the 2 years we have been trading we have donated £28,680.00 to the Poppy Appeal from sales of badges. We also hold an MOD license which allows us to use all the military badges. This allows us to also state that are products are MOD Licensed. In return for this license the MOD require us to pay 10% of net turnover. This license ensures we use the correct images on our badges and are regularly checked for accuracy by the MOD.